What’s The Point in a New Drug Strategy if it isn’t Being Funded and isn’t New? A version of this article was originally published on The Conversation. As home secretary Theresa May published the last drug strategy 7 years ago, she couldn’t have predicted what would have happened to her since. The world has changed in that time and so have drugs and the health issues that Governments must deal with. So is the new drug strategy fit for purpose in this fast changing environment? The two central ambitions remain namely to reduce the number of people who use drugs while improving recovery rates for those that develop problems with drugs. Although the aims remain the same there is recognition that a smarter way of achieving these is needed. The Home Office cite falling drug use in the population as a sign that their policy approach to drugs is effective but this is simplistic. A smarter and more meaningful assessment is to examine harm as a result of drug use. 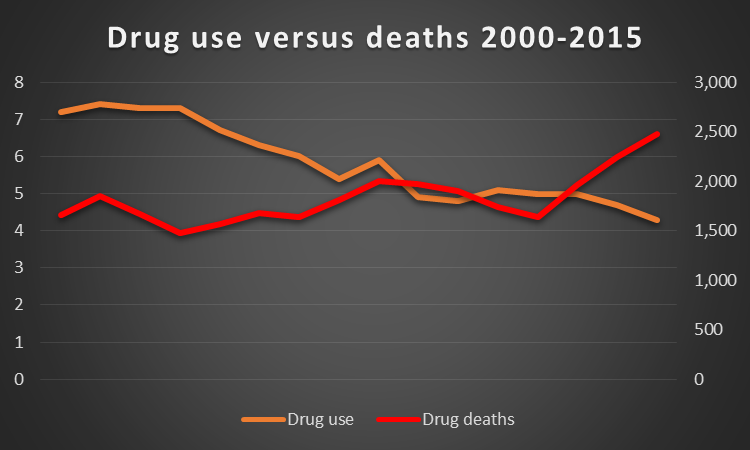 Deaths as a result of drug use continue to rise. The strategy acknowledges the significant rise in opiate related deaths and the importance of using evidence based interventions. So it is odd that there is no mention of drug consumption rooms. These not only reduce mortality but engage a hard to reach group in services that could provide support for the range of complex needs that are highlighted in the New Drug Strategy. Many factors account for the rise in drug mortality but no mention is made of the government’s move from a harm reduction approach to recovery orientated agenda. These approaches should complement rather than compete with each other. The Home Office provides drug strategy but it is local authorities that are responsible for commissioning services and initiatives that are meant to deliver its recommendation’s. Drug treatment is one part of their broader public health remit. Funding for public health has been squeezed beyond what can be achieved by ‘efficiencies’. Reducing drug related health problems including mortality will not be achieved by cutting by £22 million from this year’s drug treatment budget. So while the strategy boasts of ring fencing funding for drug related interventions, they are merely ring fencing cuts to local authority budgets. Important that emphasis is placed on early intervention and disseminating evidence based prevention. But it is disingenuous to promote these programmes when many local authorities will be unable to fund them. Without longitudinal studies which examine effectiveness of programmes aiming to reduce drug use it is difficult to make an argument for investing in such activity. Talk to FRANK is described as a credible and trusted source of information for young people, perhaps it is but it lacks a balanced approach to providing information about drugs. Its credibility could be enhanced by balancing risk information with an acknowledgement of benefits and pleasures of using drugs. Otherwise it might be time to put FRANK out of its misery. The strategy confirms that there is no intention to change drug laws. These laws have little evidence to support them and are counter to a joint statement recently published by the United Nations and World Health Organisation – Reviewing and repealing punitive laws that have been proven to have negative health outcomes and that counter established public health evidence. The strategy could have addressed this by outlining how existing laws could be maintained but using non-punitive approaches such as diversionary schemes. Does Policy Make a Difference? Alongside this new drug strategy is an evaluation of the last one. This makes clear that while law enforcement can temporarily disrupt the drug market it has only a temporary effect. The Home Office recognise that they have virtually no control over a ‘dynamic’ drugs market. On treatment there is a grudging admission that there has been a ‘disinvestment in treatment services’. There is little point recognising we have a problem with drugs, that a strategy is needed to deal with this and then ignore international evidence that provides solutions. The real crime is cutting funding at a time when we need to invest in prevention and treatment to reduce drug related mortality. Problem drug use is a health issue not a criminal one, time for the Home Office to handover responsibility to the Department of Health. Want to comment or contribute?